Happy Monday! I know Mondays get treated like the red-headed stepchild, but I think Mondays are the perfect day to press that reset button and ensure that not only is your week productive, but also helping you inch closer to your goals. I spent the better half of yesterday meal prepping for the first time, and while it was definitely time-consuming (I made twelve lunches and twelve dinners for both hubby and me for the week) it allowed me to set myself up for a productive and healthier week. After that I decided to set up other mini goals to help me better reach my main goals for this year, which definitely includes more blogging (YAY)! I know I haven’t been posting as much as I would like, but the last few months since I’ve become a new mom has been both rewarding and tiring. I think the hardest part has been finding a routine or some sort of normalcy as I settle into my role as a Hooyo (Somali word for mom), but now that my little one is three months old, we have established a “routine” (I use that term loosely) and has allowed me to have some sort of consistency and slightly more sleep (FINALLY). Now that we have a new normal going on, I decided it’s the perfect time to get back to crushing my goals, which is why I’m loving this quote I found over on Tumblr. I know that some goals might seem unattainable, but that’s why I love creating smaller ones. This allows me to set up realistic expectations, which ultimately gets me closer to those bigger goals. 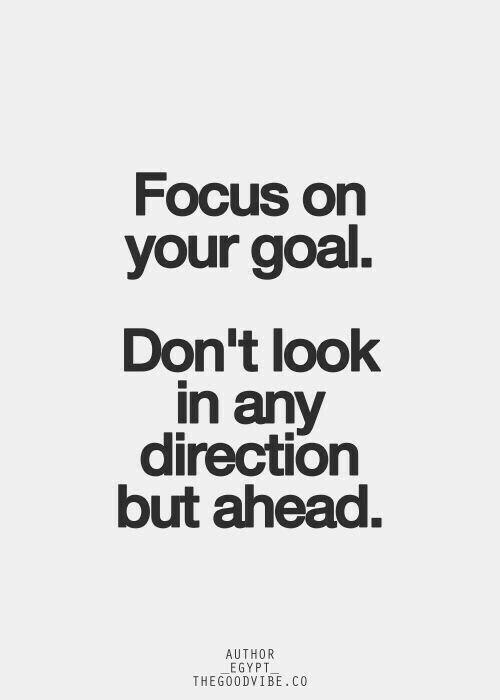 I also know how easy it can be to get distracted and loose sight of your goals, especially when it seems like so many other things are happening around you, but by looking ahead and focusing only on your goals, you will see what really matters. So look forward and cut off anything or anyone that’s not helping you get ahead. Your future self will thank you (trust me).